Nestled in the scenic forest landscape of tranquil Lower Harifu Village, Mukashi Mukashi is a 2016-built chalet beauty with six en-suite bedrooms plus a nanny room, designed as a sanctuary that effortlessly becomes part of the stunning Niseko scenery; an artistic architecture at its best. Dramatic walls and panels of floor-to-ceiling glass in bedrooms frame the extraordinary natural setting and give the impression that guests can directly reach out and touch the outdoors. The effect is spectacularly modern, and the minimalist design indoors showcases the green or snowy scenes beyond the warmth of the chalet. The white kitchen and walls create an almost futuristic feel, with a wooden table snugly fitting to give the open-plan kitchen-diner with flat-screen TV a homely feel too. 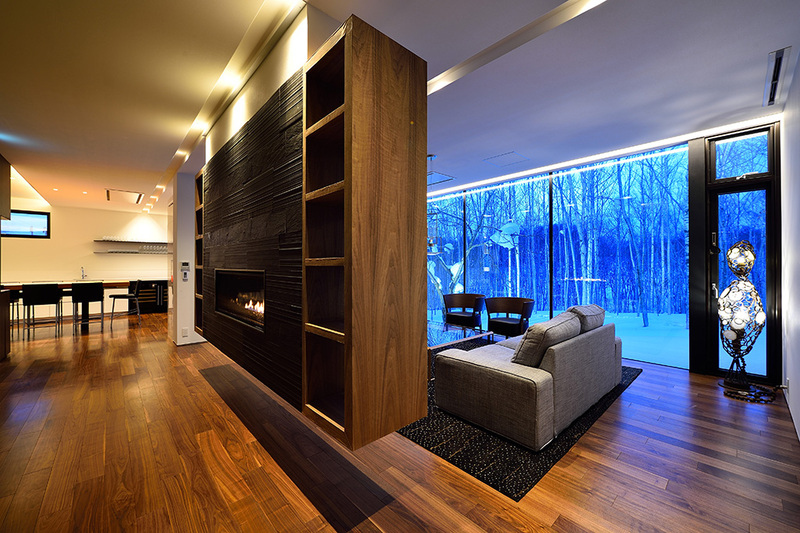 The quiet lounge area feels wonderfully separate, and the wall of glass facing an uber-contemporary gas fireplace is hip and projects real design quality. On a practical level, Mukashi Mukashi boasts a double bunk bed kids’ room as well as a nanny’s room with a bunk bed and a ski dry room. While the lounge has more of a sophisticated vibe, the big media and entertainment room is perfect for enjoying a movie on the enormous flat-screen TV, with seating for 16. Read or download Terms & Conditions of Mukashi Mukashi.